Love, love, love this one! Our persnickety beloved heirloom tomatoes have been uber slow this season, and peppers as well. Thankfully, a great farmstand down the road has fine tomatoes and a great pepper selection from spicy to tasty sweet. First batch of salsa last week is long gone, and 2nd batch of gazpacho (Ina's too!) in the fridge! 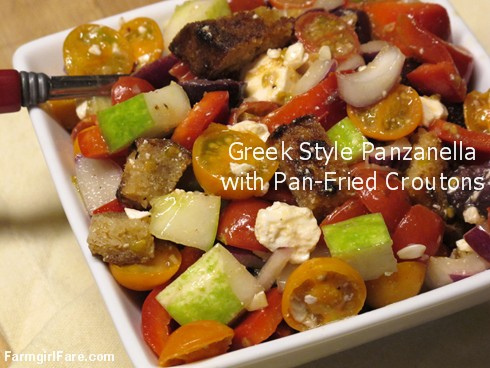 Realize Ina's panzanella is exactly her gazpacho, just whirred up and sans pan. ;) Thanks for the reminder of this beautiful salad. Don't you adore big batches of great food that are even better the next day for breakfast? Why don't you come over for gazpacho this morning? We'll even have toasted bagels with! Hugs to youse, kiddo! Oh, yum! Susan, I could never in a million years get The Shepherd to eat this salad, but maybe if I take it to a potluck, there will be some left over. Made a chicken stew with some end of summer vegies tonight - it was delish - I may have to write down the recipe before I forget it - LOL, That's what I love Pinterest for! Electronic hoarding :-) T.